The immune system in humans and animal is complex, all the more so because it crosses over all tissues. The traditional view has been that the immune system keeps itself in check, and that is mostly the case. However, for some years there has been a development of a neural feedback loop comprehension that helps to answer some of the complex mechanisms and remarkably ties in the role of a nutritional strategy for immune management. This is known as the inflammatory reflex. The inflammatory reflex, a prototypical neural circuit that modulates innate immunity, is activated by the presence of cytokines or other inflammatory products in tissues that triggers afferent (a nerve that passes impulses from receptors toward or to the central nervous system) action potentials travelling in the vagus nerve. The ascending information is relayed to brainstem nuclei that control efferent (nerves that convey nervous stimulus from the brain to other parts) neural signals in the form of action potentials transmitted back to the periphery via the vagus nerve. Whilst this may sound complex – few subjects that combine neurology and immunology aren’t… the outcome suggested meets simple strategies, based on complex mechanisms. This information is relayed to the spleen and other cytokine-producing organs, where cytokine expression is inhibited by a molecular mechanism that requires signal transduction via a specialist receptor called the nicotinic α7-acetylcholine receptor subunit. This receptor responds to the chemical nicotine found in cigarettes and partly explains why some people who smoke anecdotally report they are able to limit the unpleasant effects of ulcerative colitis, although a less damaging strategy using the same receptors is explained below. Our food selection not only mediates our microbial compositions but also helps us to limit the potential adverse consequences of a large amount of antigenic material arriving at the mucosal surface during a meal. Here the innate immune system has to be able to assess large amounts of foeign matter and in a healthy state will tolerate it without producing adverse gastrointestinal effects. Consumption of fat in the diet can activate the cholinergic anti-inflammatory pathway (the name for the anti-inflammatory reflex) suppressing the release of pro inflammatory cytokines. This occurs in part due to the release of cholecystokinin (CCK), a neuropeptide excreted after consumption of dietary fat that triggers several digestive functions including stimulation of gall bladder contraction and exocrine pancreas secretion, and activation of afferent vagus nerve signals that include amongst their outcomes the sensation of satiety. 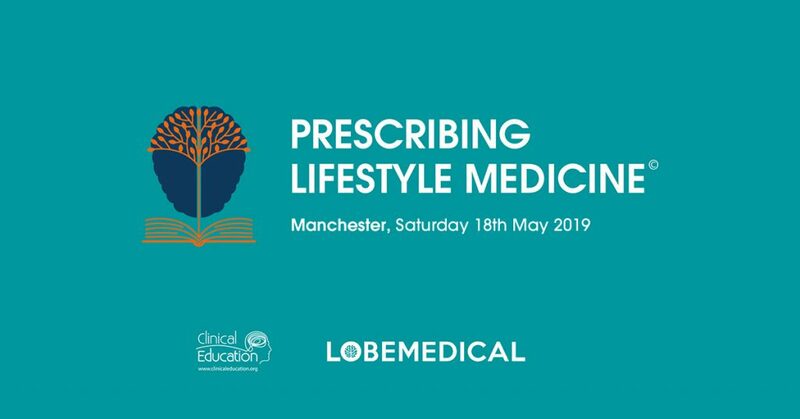 Consistent with this idea, clinical studies have shown that administration of fish oil is therapeutic in patients with ulcerative colitis, but not in those with Crohn’s disease where there is indication of relevant receptor damage, so that suitable responses are prevented. The study by Luyer et al. suggests the possibility that these protective effects are dependent on fat-induced activation of the cholinergic antiinflammatory pathway. 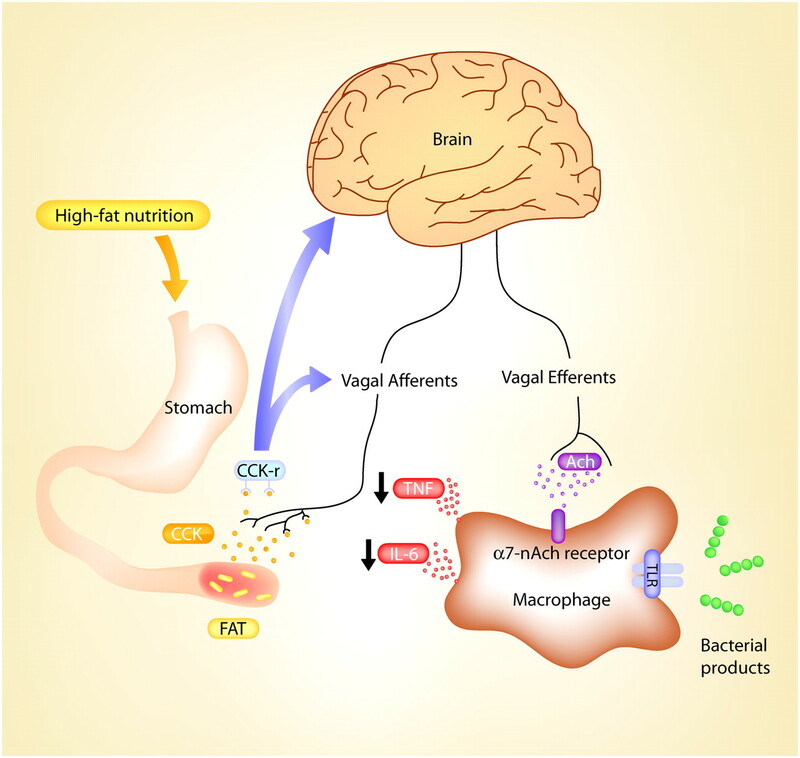 Dietary fat inhibits the inflammatory response by way of stimulation of CCK-receptors leading to activation of nicotinic receptors by vagal efferents. 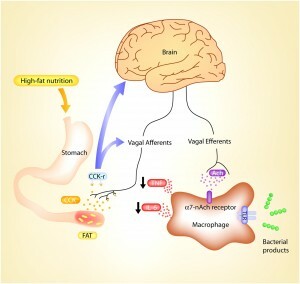 Ingestion of high amounts of fat induces release of cholecystokinin (CCK) that binds to CCK-A and CCK-B receptors (CCK-r) located centrally or on peripheral vagal afferents. Activation of CCK-receptors triggers vagal efferents leading to an increase of acetylcholine (Ach), the principal parasympathetic neurotransmitter. Release of inflammatory cytokines such as TNF-α and IL-6 after activation of Toll-like receptors by bacterial products is inhibited by way of binding of acetylcholine to α-7 nicotinic (α7-nAch) receptors. The cytokine-braking mechanisms exerted by the motor arc of the inflammatory reflex, called the ‘cholinergic anti-inflammatory pathway’, prevents the damaging consequences of excessive innate immunity. The organ that sits in the middle of this pattern is the spleen, and whilst there is limited data, there does seem to be an association between IBD and spleen function. Patients with hypo functioning spleens have more active and extensive disease. The spleen has been called “the most important organ for antibacterial and antifungal immune reactivity”, filters aged red blood cells and microorganisms from the blood. Advances in spleen anatomy have elucidated an organisation of lymphoid compartments, arteries and nerves in the white pulp, separated from the red pulp by the marginal zone. Rarely do Nutritional Therapists consider the role of the spleen in managing food driven immune responses, largely as in medicine, unless it has suffered physical damage it is forgotten. So many people seem to be able to manage a life only modestly compromised by the extraction of the spleen, that it has to some extent gone the way of the vestigial tissue the appendix – albeit that this organ is gaining new respect for its role in managing the ecology of the colon. The use of fatty acids to limit inflammation both from total food and supplementation via the neural feedback has mostly been undertaken via enteral nutrition. Nutritional Therapists need to keep in mind that low fat diets may be contributing to gastrointestinal immune problems that extend far beyond the local tissues and that oral supplementation of EFA’s may need to be far higher in terms of total fat, as well as ratio to achieve a therapeutic outcome. Lastly the use of glandular to support the health of splenic tissues is an old naturopathic strategy but poorly supported in terms of published data approach to spelnic health. However, glandular therapy is clinically very successful in patients with adrenal related dysfunction and that correlation may provide a starting strategy for future examination. The use of splenic supplementation may now be considered an adjunctive approach to modifying mild to moderate local and sytemic inflammation along with exercise, meditation and other natural or lifestyle orientated approaches to inflammation control, such as thos discussed in this post. I have a 21 yr old son who suffers from excema. He is currently attemping to follow the “Paleo” diet. Any suggestions for modifications, or supplements that may help him? Thanks for this Michael, very interesting re the role of the spleen. Is there any more recent information on its role in neuroimmunology? And does this suggest any peer reviewed treatments for a client with poor fat digestion, (possibly due to pancreatic enzyme insufficiency), and Ulcerative Colitis? The client in question also had a serious head injury about 15 years ago, resulting in insertion of steel plates in the left side of their skull. I wonder could this structural injury have affected this inflammatory pathway?